Love shooting hoops? Need a basketball that works on both indoor and outdoor courts? All the major basketball brands produce basketballs that are made to suit versatile conditions – and in this guide, we seek to find what the best indoor/outdoor basketball is. Of course, sometimes, a dedicated outdoor basketball would suit outdoor play better, and a dedicated indoor basketball would suit indoor play better – but there are times where versatility is what’s needed. With all our buying guides, we look to PRICE, DURABILITY and PERFORMANCE of the basketball. However, with particular focus in this guide, we look at the PERFORMANCE of the ball across all types of surfaces. We do our best to ensure that you don’t waste your money on a basketball that does not suit your needs. What is the Best Indoor/Outdoor Basketball? When you talk basketball brands, most people think Spalding. And when it comes to finding the best indoor/outdoor basketball, there aren’t too many basketballs out there that are better than the Spalding Zi/O Excel. This particular basketball is modelled off the official NBA ball. This means that it sticks true to the official size and weight of NBA basketballs. Further, the Zi/O Excel is created with a composite leather material which makes it excel on indoor surfaces, whilst being an admirable contender on outdoor surfaces. Feels soft in the hand, and is very tacky when first bought. Whilst versatile, this basketball will perform much better on indoor surfaces. In particular, it will scuff quite fast when used on abrasive outdoor courts. Although it won’t fall apart, the grip on the ball will drop dramatically when only used outdoors, and air retention may start dwindling with outdoor use . However, durability is not an issue for indoor use. It will hold shape well when treated with respect. For it’s price point, versatility and durability, you can’t really go wrong with the Zi/O Excel. Amazing value. Comes in Intermediate and Official sizes, but also comes in the standard Spalding Zi/O basketball. The difference? The standard Zi/O is made with a different composite material – even more suited to indoor use, and only available in the Official size. It will smooth out a LOT faster than the Zi/O Excel when used outdoors, however, does not tear. We’ve already referred to this basketball in our best outdoor basketball guide – which naturally means there’s no reason why it should not be on this list. The Wilson NCAA Replica is a really versatile basketball that performs well on both indoor and outdoor surfaces. In particular, it meets all official sizes and weights true to NCAA regulations, whilst being priced at really affordably. Made with a composite material, this basketball is extremely durable on outdoor surfaces. In fact, it’s probably the most durable basketball on this list when used solely for outdoor play. Yes it does tend to lose air faster outdoors relative to indoor play, but that’s to be expected with most basketballs on this list. The NCAA Replica is also made with Wilson’s Cushion Core Technology. As we have already mentioned in our other article, this gives the ball awesome grip to the hand – as well as a really authentic bounce. Grip will naturally wear away with frequent play on abrasive surfaces. Fantastic value for money, available in both Intermediate and Official sizes – this should be seriously considered for anyone purchasing an indoor/outdoor basketball. 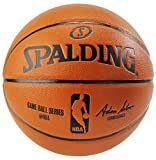 Another ball which is true to NBA and WNBA regulations, the Spalding NBA Replica is another basketball which offers great value for money. First, it’s another extremely affordable ball that won’t break the budget. This particular ball is made with a leather composite material. It’s durability in outdoor settings is amazing. What makes it different though? There is a large amount of rubber which is on the basketball. This is so the ball can withstand more abrasive surfaces – excelling in outdoor, and yet not being limited to outdoor areas. Further, it’s an extremely grippy basketball, and does not require any time to break into. However, it has been noted that after consistent outdoor play, the basketball will lose a lot of it’s initial tackiness. This will cause the grip to slowly disappear – giving the ball a much more rubbery feel in it’s later years. Whilst it comes in Intermediate and Official sizes, keep an eye out for the bundled package that sometimes pop up on Amazon. This package includes an Official sized ball bundled with a small ball pump. 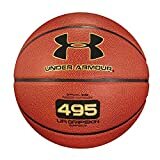 Not a particularly big brand when it comes to basketball, but Under Armour have provided a seriously good indoor/outdoor basketball, big on versatility. The dynamic Under Armour 495 basketball is created with UA’s Gripskin – being a composite material. This particular material is tacky, making this ball nice and grippy. But we note that it’s not overly tacky that grip compromises the overall feel of the ball. Adding to grip, the channels are quite deep, which gives the basketball a physical depth aspect. We understand this might not be to everyone’s taste, so it should be taken into consideration. Another difference is that this ball isn’t true to NBA or NCAA regulations. It is slightly heavier than other basketballs on this list. Durability is also a big factor of UA’s basketball. It works fantastic indoors and out (with a degradation speed being faster on more abrasive surfaces). This is, of course, to be expected. For us, this ball doesn’t really stand out in either indoor or outdoor surfaces. However, what is is good at is being a basketball that excels in being versatile. Available in Youth, Intermediate and Official sizes. Do not simply ignore this ball because of it’s brand – it should be seriously considered when looking for the best indoor/outdoor basketball for versatility. 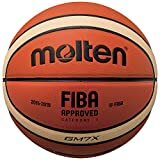 The final basketball on the list of best indoor/outdoor basketballs is the official ball of FIBA – the Molten GM7X Indoor/Outdoor. Like most on this list, the GM7X is a very versatile ball and works really well in both indoor and outdoor surfaces. Particularly, it’s made with a synthetic material which is designed to suit both the softness of a hardwood floor, as well as the abrasion that outdoor surfaces provide. Created with completely symmetric and aligned pebbles, you definitely do not need to worry about grip. This basketball is great to the touch, and grippy as ever. In terms of how the basketball plays, the Molten GM7X is designed with Molten’s signature 12 panel design. The benefits? Well it provides extra grooves which MAY aid grip. However, for players who have never used a Molten basketball before, it might require some time to get used to the extra panels. Another thing that might take some time getting used to is the fact that the ball feels slightly smaller than a standard sized basketball. Whilst this may only be by a fraction of an inch, it still makes a huge difference during play. Either way, it’s available in a Junior, Intermediate and Official size. With a large number of brands and basketballs, finding the best indoor/outdoor basketball requires a bit of consideration on your behalf when looking to the differentiating factors of different balls. The following are the factors we believe are most important take into account. Naturally, it’s up to you as to which factors you consider to be more important for your situation. Simply said, it’s important to get the right sized basketball for your needs. Most, if not all, come in either a Youth, Intermediate or Official size. These sizes are separated by an inch. However, this really does make a huge difference in the development of fundamental handling and shooting skills. You can’t perfect your skills with an official sized ball if you’re 5 years old without having your hands completely developed in size. Get the size that most suits the skill set and age of the player. In order to buy a basketball that is suitable both indoors and out, you need something with good durability. It’s pretty clear to say, but indoor surfaces are softer than outdoor surfaces. But in saying that, you don’t want to get a rubber basketball and use it on indoor surfaces. That’s why these versatile basketballs are made with composite or synthetic materials. Accordingly, finding the right ball with a good amount of durability is key. We can assure you that all the options on this list are durable. Cost is a factor that can make little to no difference here. 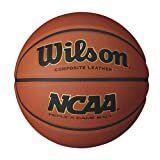 Whilst there is a huge range of indoor outdoor basketballs that come in very different prices, all the ones on this list are priced around the same mark. Why is that? Well because they’re all of the highest quality possible. Expect to spend anywhere from $30-$50 for a quality basketball with good durability. The fact that the basketballs on this list are suited to both indoor and outdoor surfaces, maintenance is a lot easier. However, there are some simple tips that you can implement to increase the longevity of your basketball. First, store your basketball properly. Don’t leave your basketball under a pile of heavy objects, and don’t leave it in direct sunlight. This will destroy the integrity of the ball, and you’ll be back buying a new basketball before you know it. Second, do not sit or kick your basketball. Again, sitting or kicking your new basketball will again destroy the integrity of the ball, and will egg the shape of it before you know it. An egged basketball will not work well. Finally, wipe down your ball after use. This will get rid of any excess dirt or moisture on the basketball. This will ensure that the material is not destroyed due to foreign substances that sit on the ball for (potentially) weeks on end. When looking for versatility, finding the right ball to suit your need is important. Ask yourself. 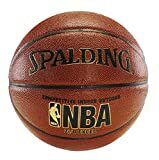 Do I want a basketball that works better indoors or outdoors? 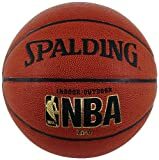 Do I only play indoors, outdoors, or do i really need the best indoor/outdoor basketball? These are preliminary questions that must be answered. Still want an indoor/outdoor basketball? Considering all potential factors, it is extremely hard to go past the Spalding Zi-O Excel, or even the Spalding Zi-O. Great price, awesome durability, feels great, and very grippy. However, if for whatever reason you are unhappy with our analysis, or want to say something else, get in contact via our contact us page, or by commenting here.